Directions: The Mitchell Creek Canyon Trail is only accessible by walking along the paved Mitchell Creek Trail for a little ways. There are multiple places to pick up the trail but this description begins at Founders Park. 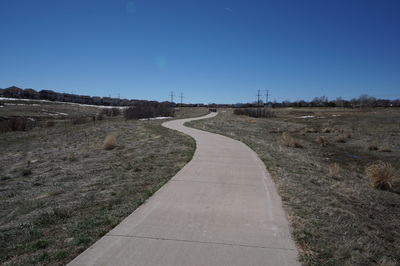 To get to Founders Park exit I-70 at the Founders Parkway (86) exit and turn left onto Founders Parkway. 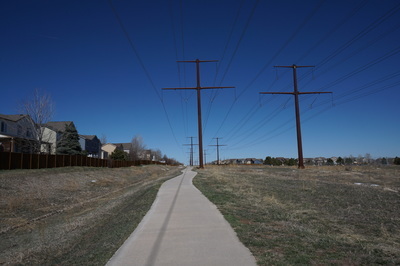 Follow Founders Parkway for about 4 miles and turn left on 5th Street, to stay on 86. 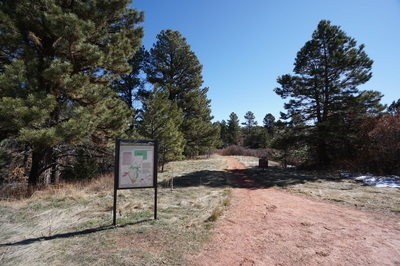 Turn right onto Enderund Blvd and continue to Founders Park. 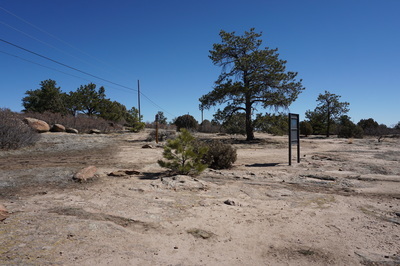 Just before the park is a small driveway that leads to a small parking lot. Park here and walk up the sidewalk to the unnamed paved trail that leads behind a housing development. 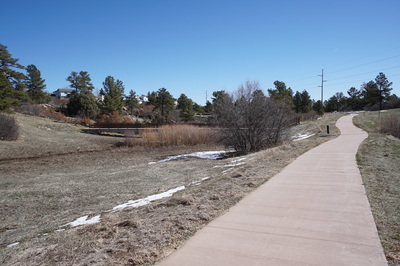 After .3 miles you return to Enderund Blvd, cross the street and pick up the Mitchell Creek Trail. 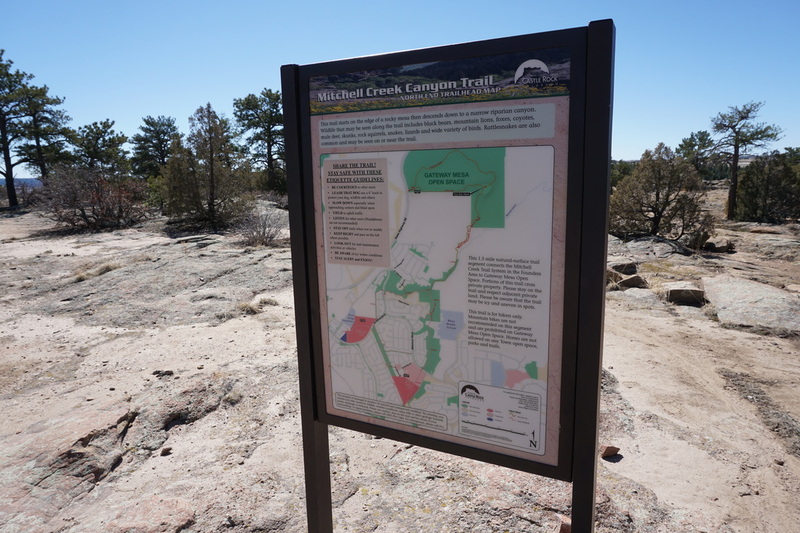 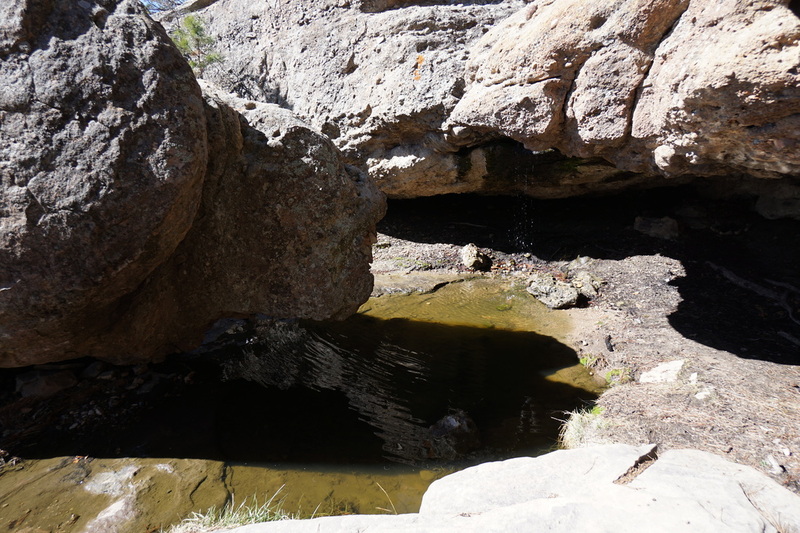 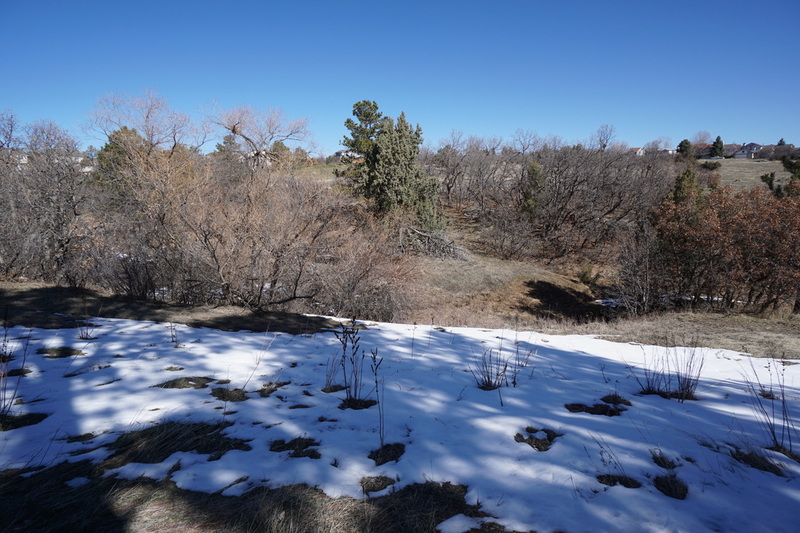 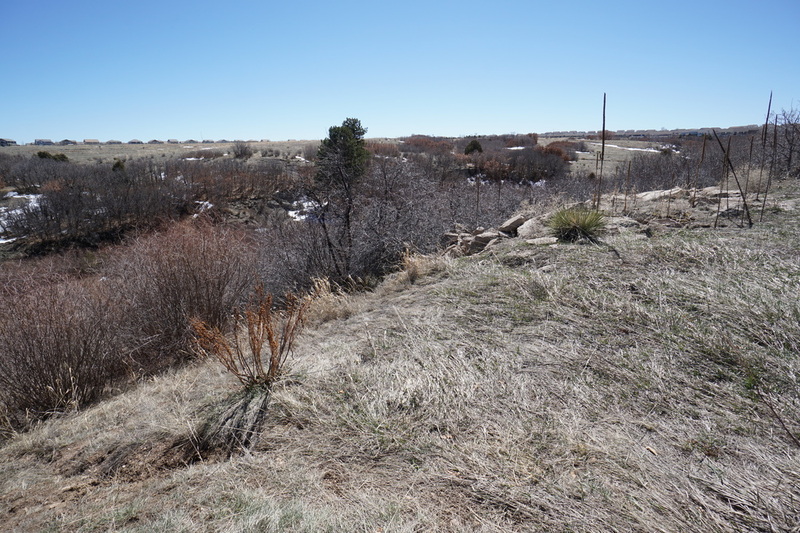 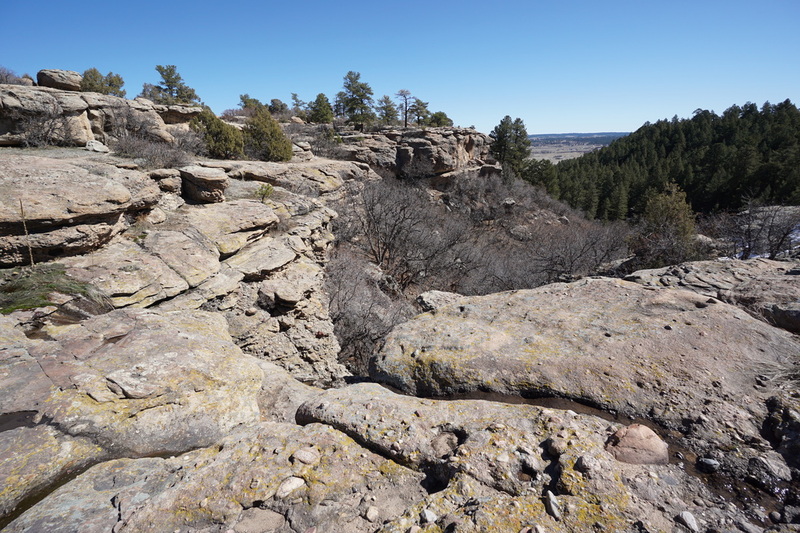 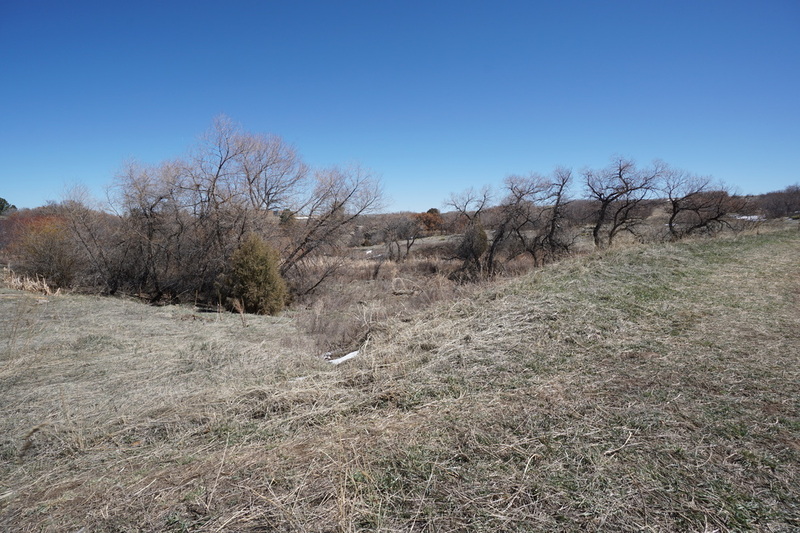 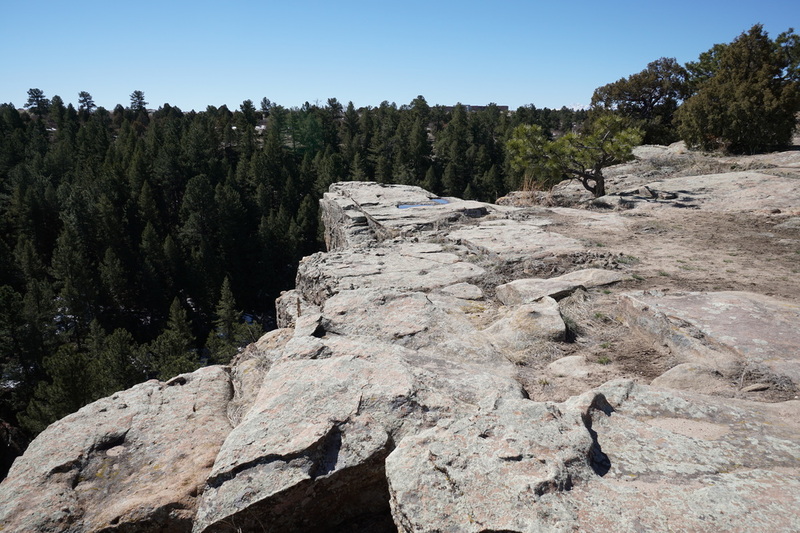 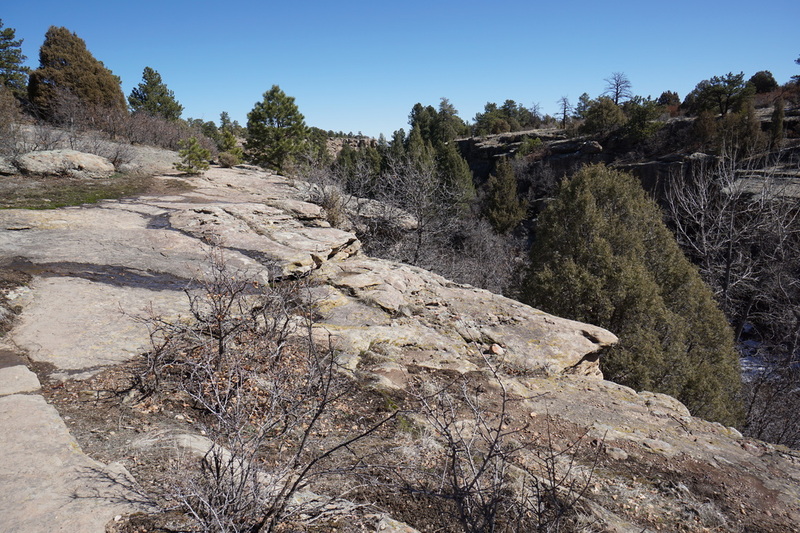 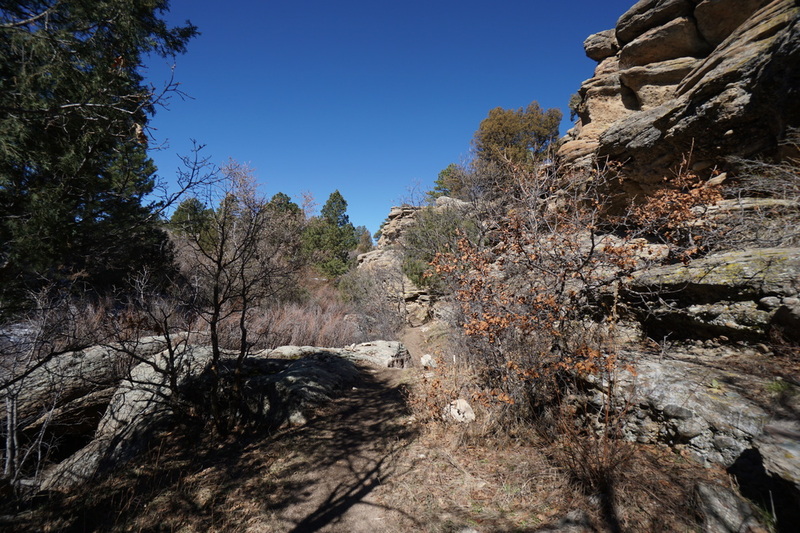 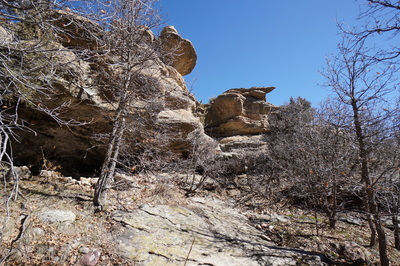 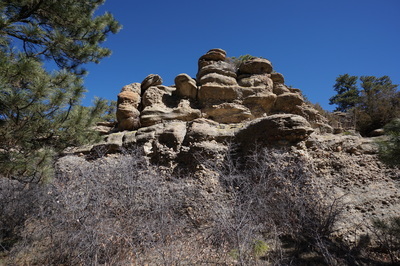 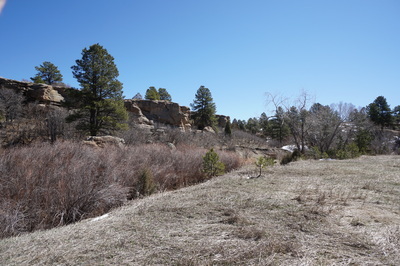 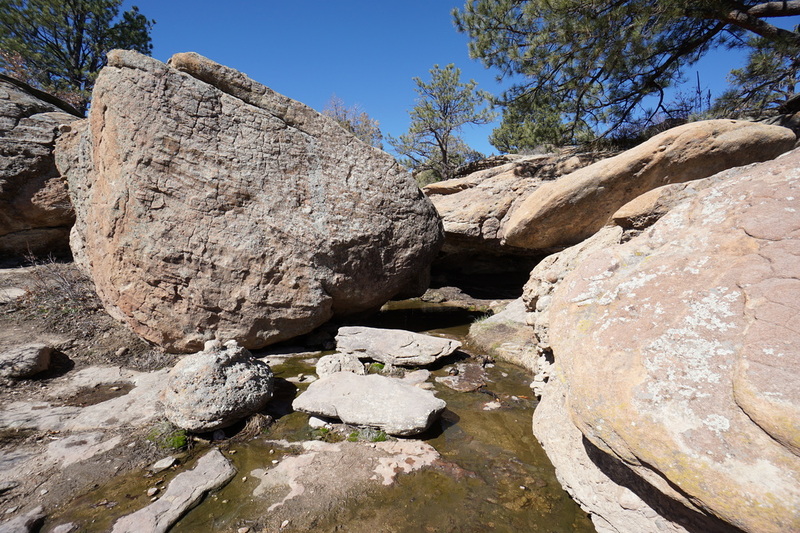 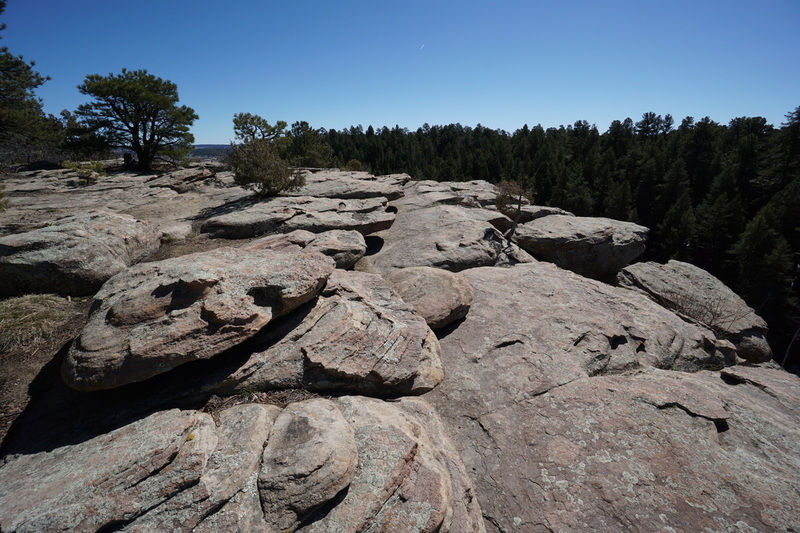 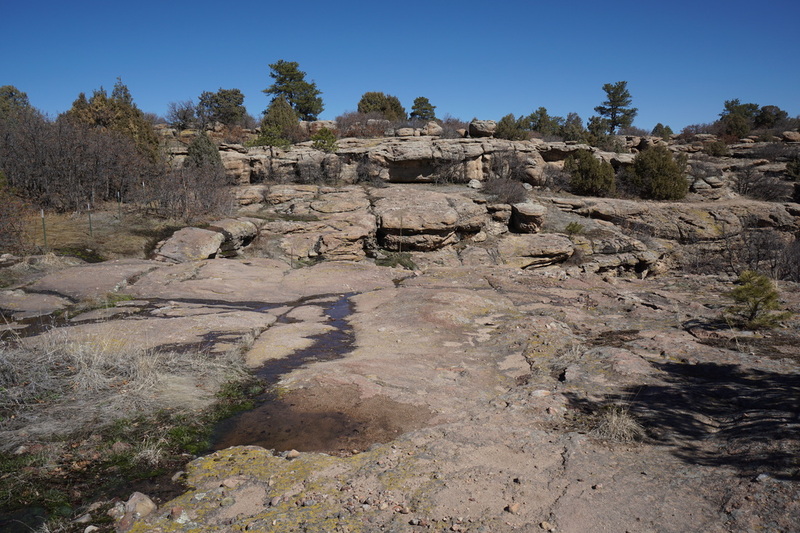 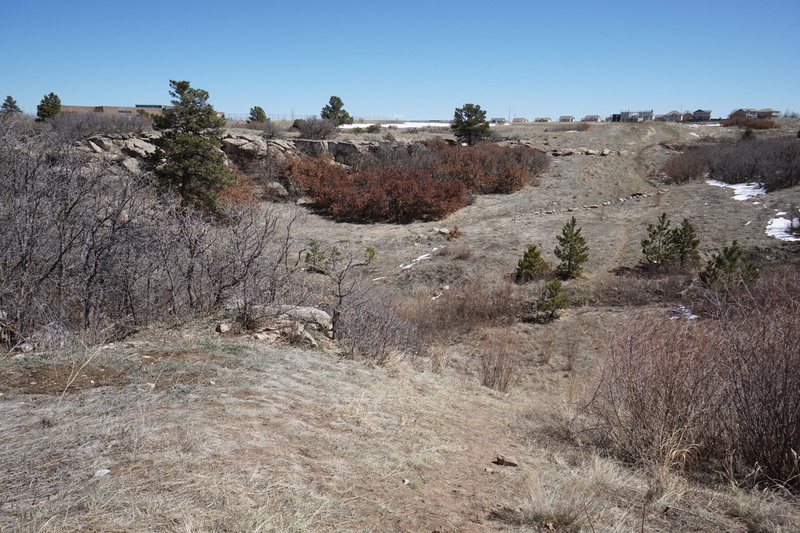 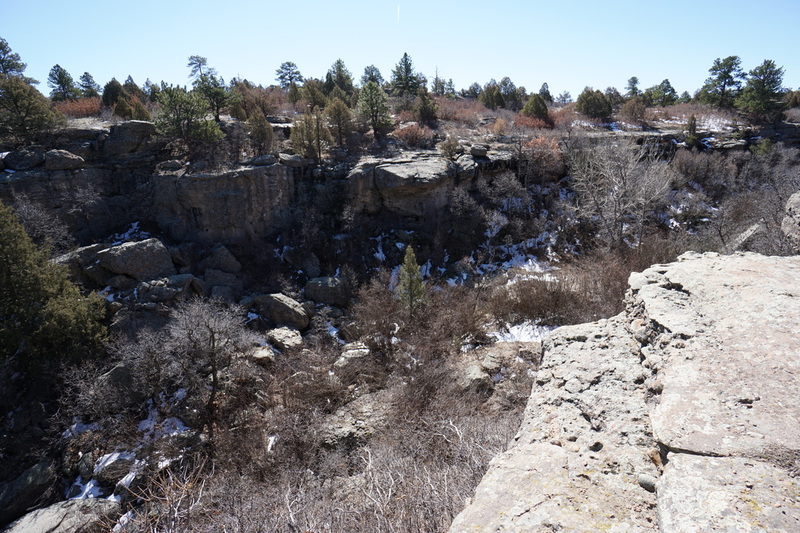 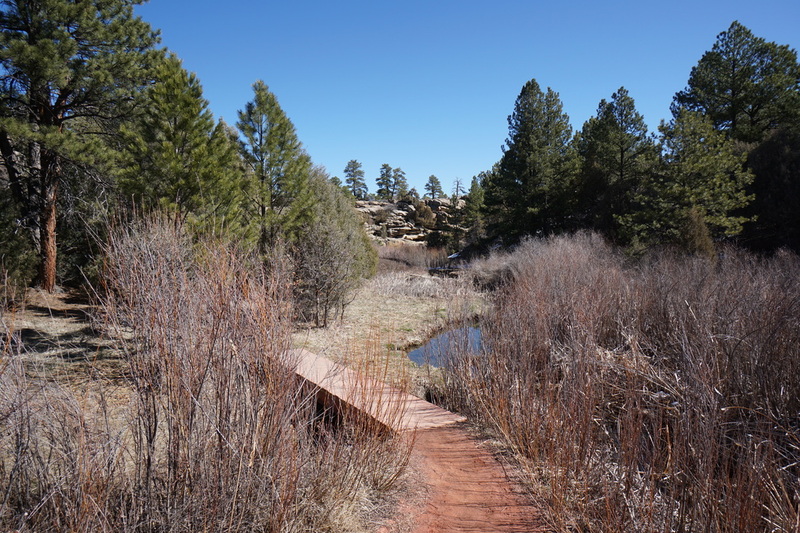 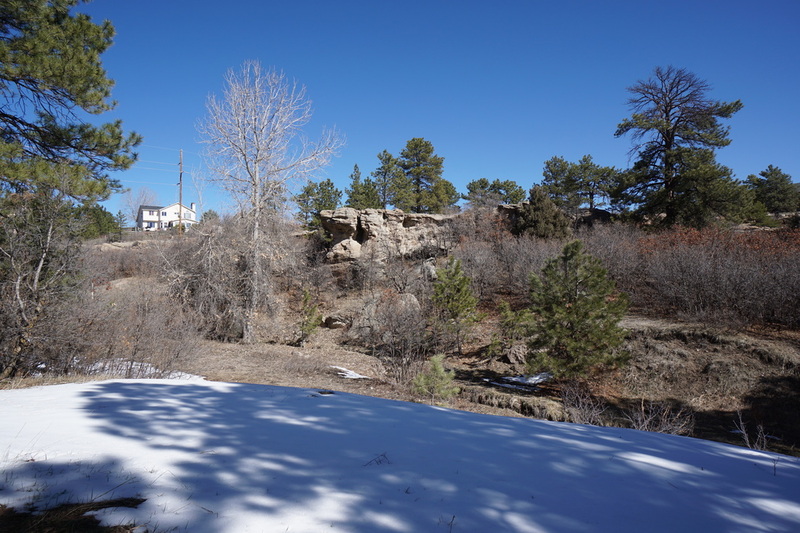 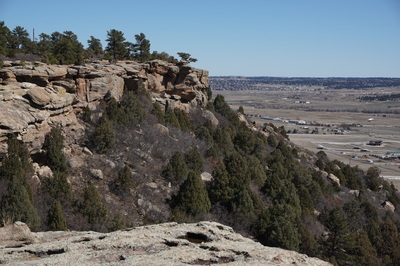 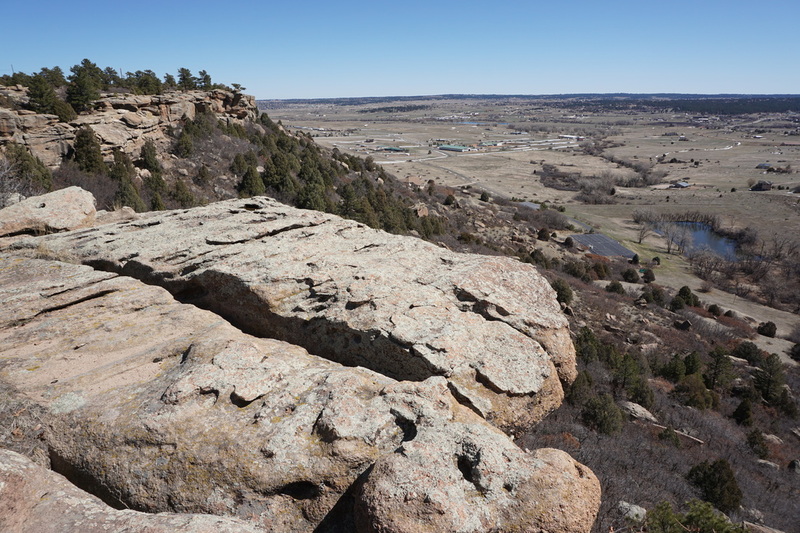 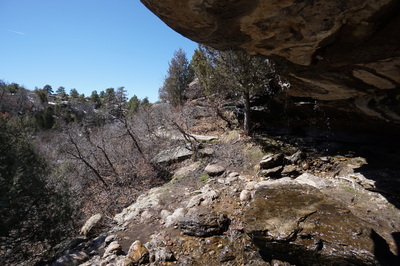 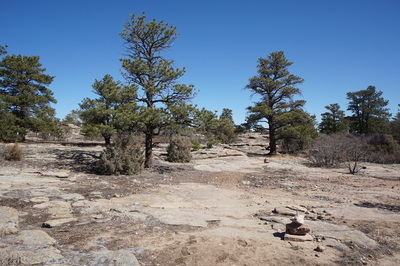 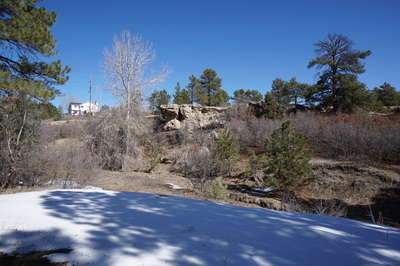 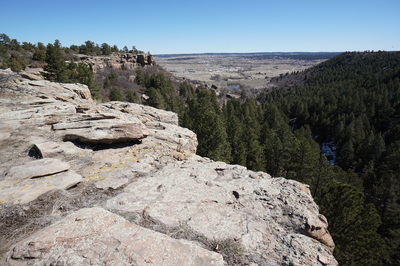 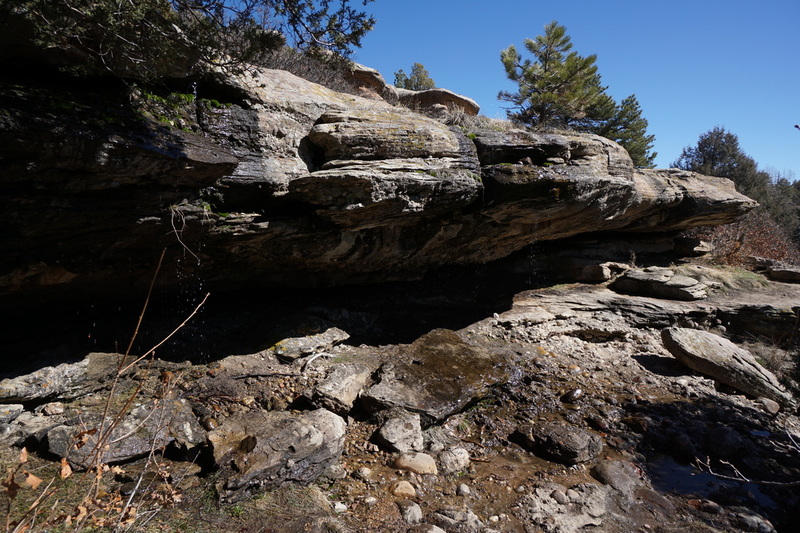 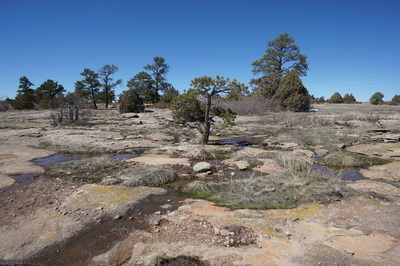 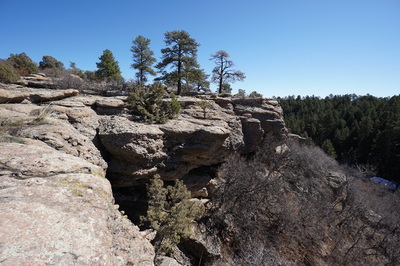 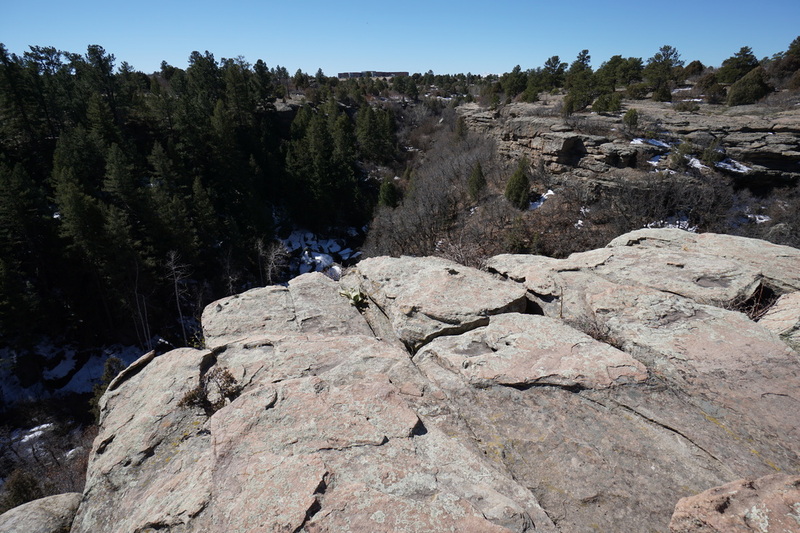 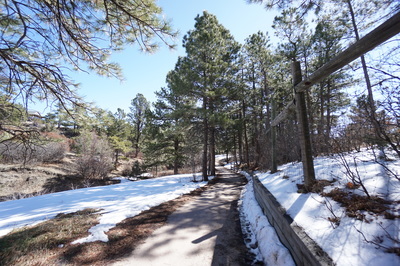 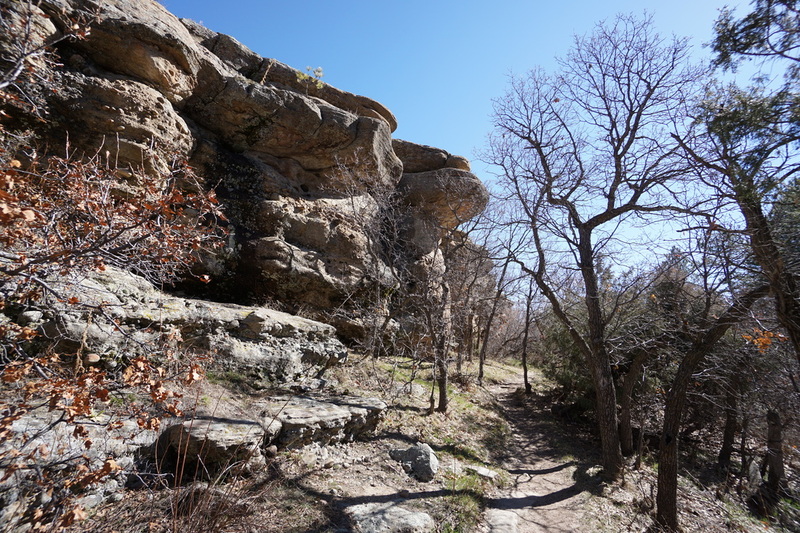 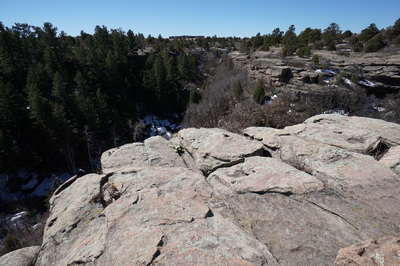 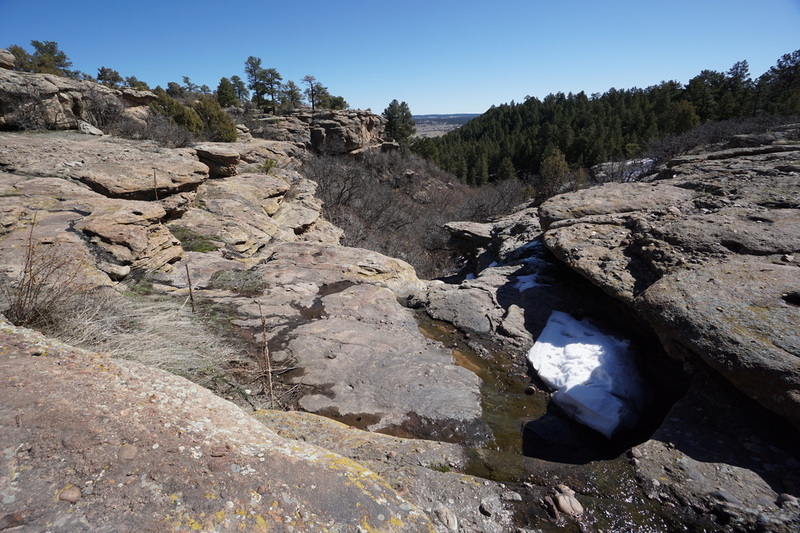 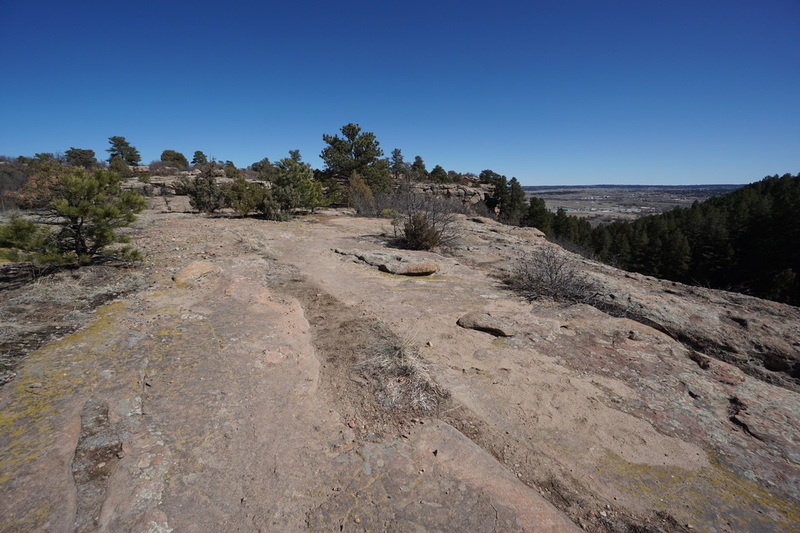 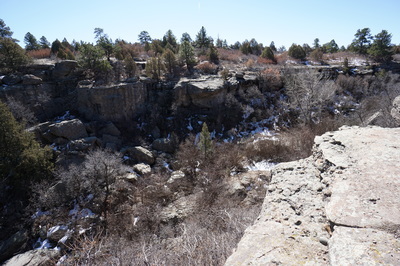 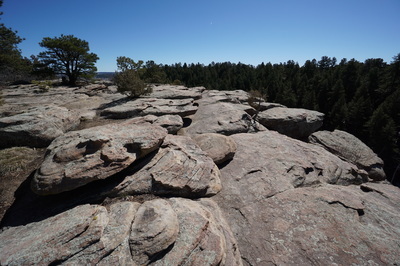 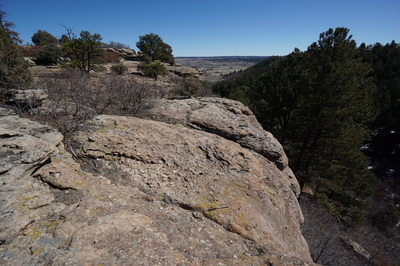 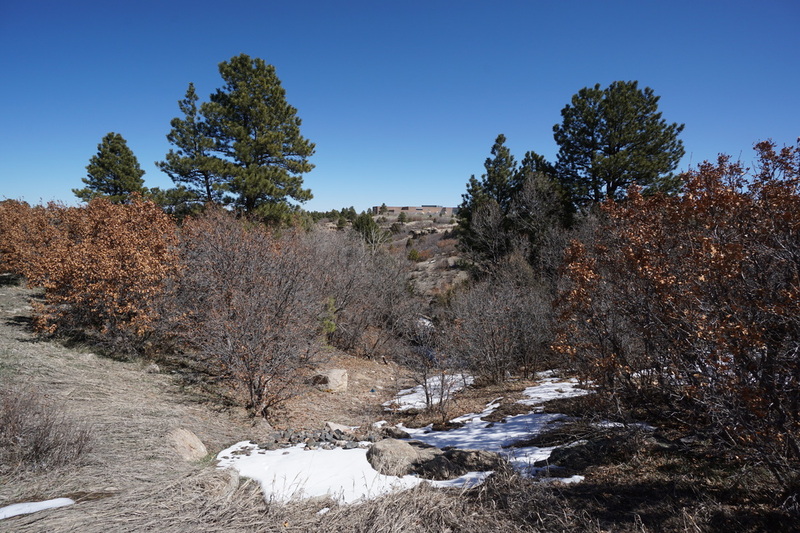 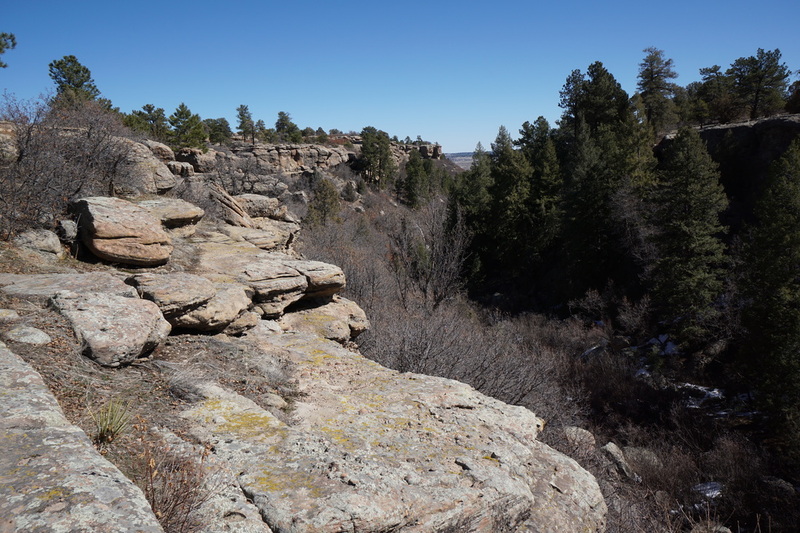 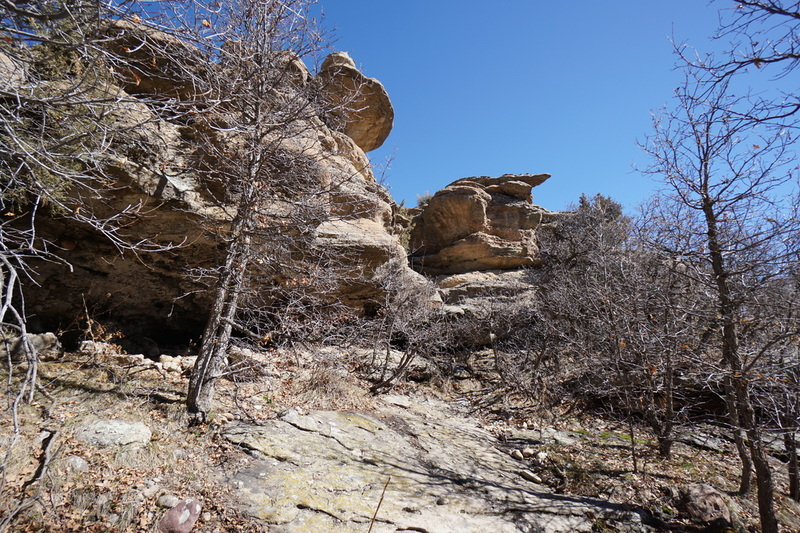 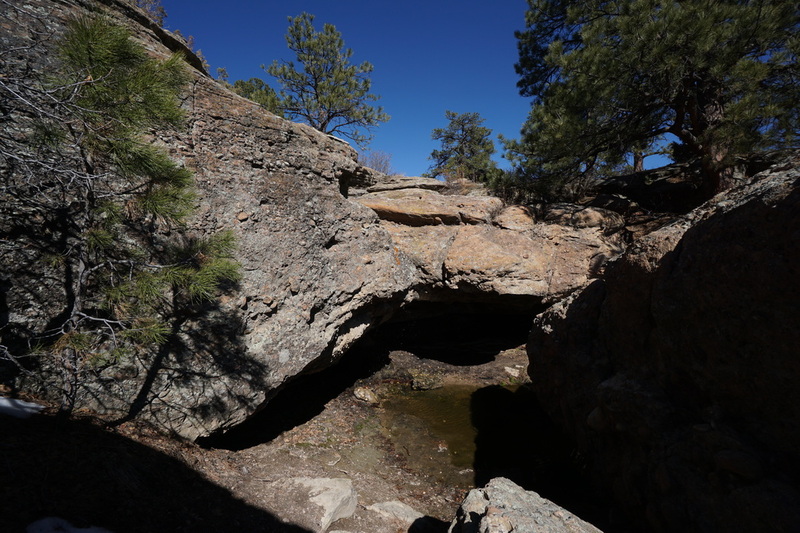 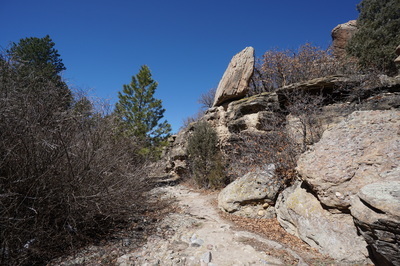 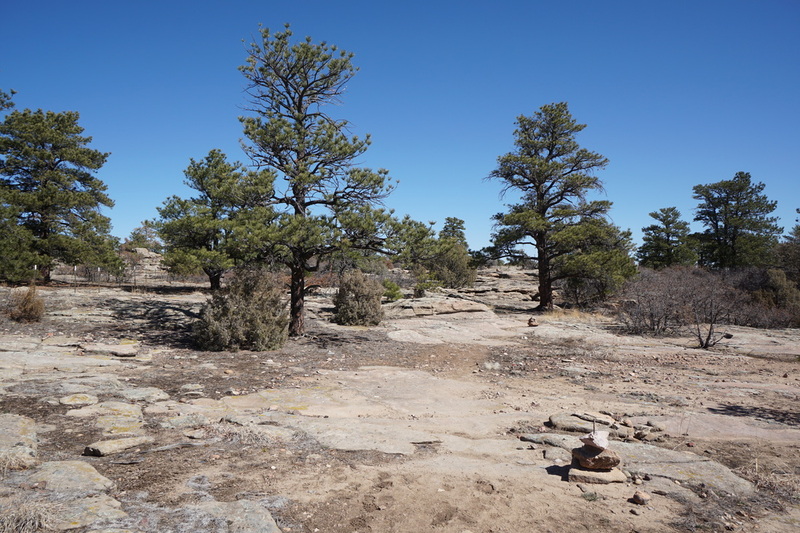 The Mitchell Creek Canyon Trail is a wonderful Castle Rock parks and open space trail that connects the paved Mitchel Creek Trail to Gateway Mesa Open Space. 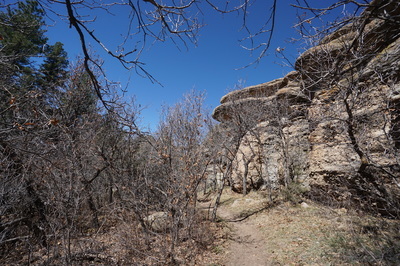 The trail starts along the floor of a narrow rocky canyon and gradually works it's way up to the rim of the Canyon. 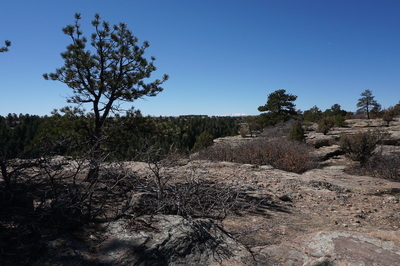 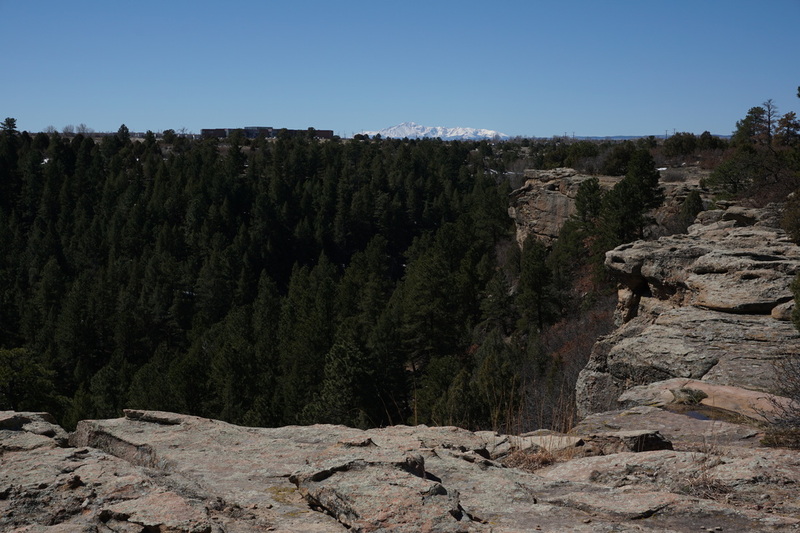 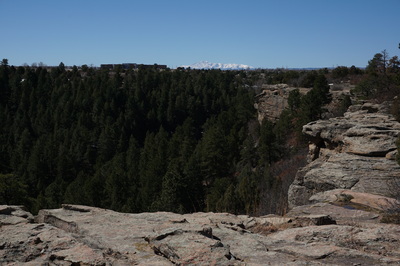 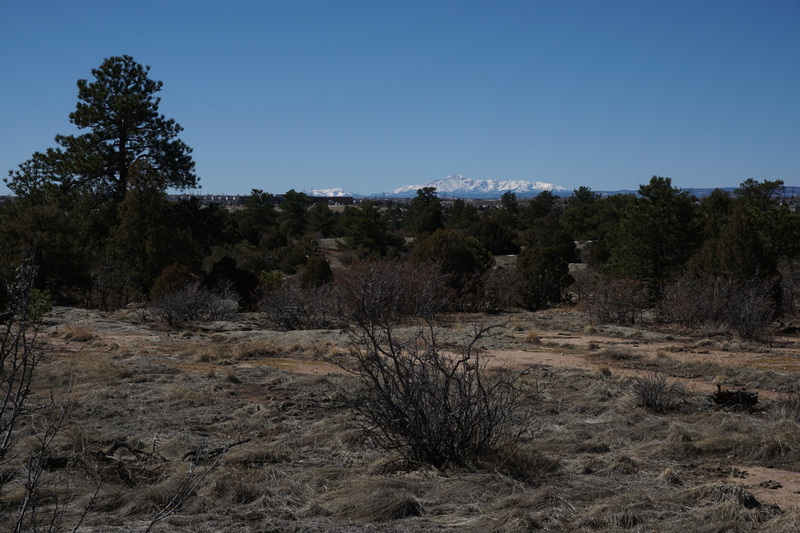 It then follows the canyon for about a mile with terrific views of the canyon, the plains, and Pike's Peak towering in the southwest distance. 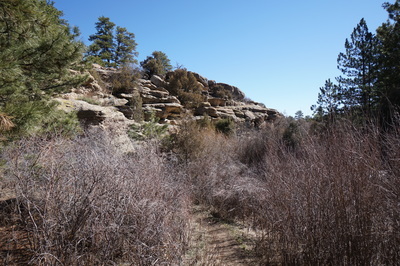 This trail mostly traverses slickrock making it a great hike for the early spring when most trails turn to mud. 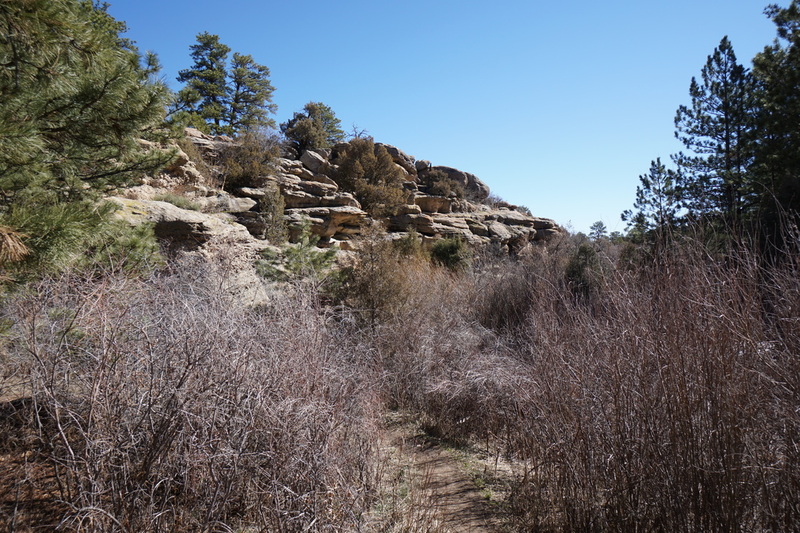 The trail also crosses through scrub oak forest which should be extraordinary in the fall. 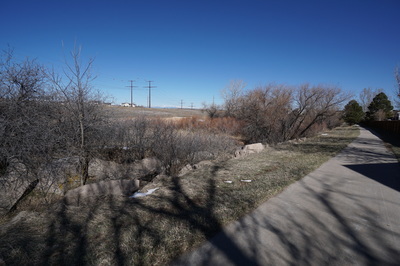 From Founders Park, the paved Mitchell Creek Trail cuts through suburban open space until it starts to approach the canyon area. The Mitchell Creek Canyon Trailhead marks the beginning of the natural surface trail. 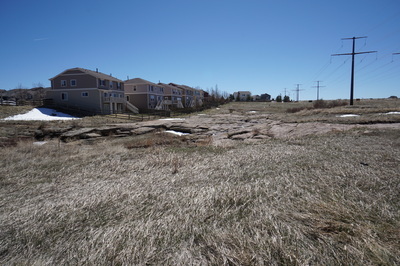 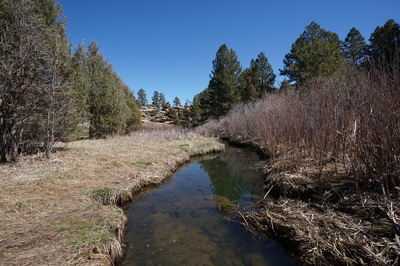 The trail starts out by crossing a meadow/wetland area with Mitchell Creek flowing through the middle. Cross a small footbridge and approach the canyon. 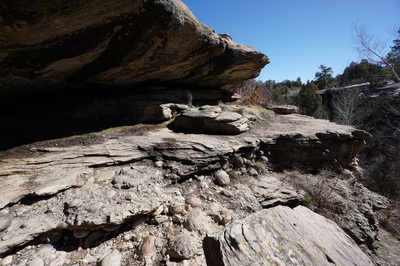 From here on out the trail shuffles along over slickrock (follow the cairns) and explores various grottoes and rock nooks and crannies. 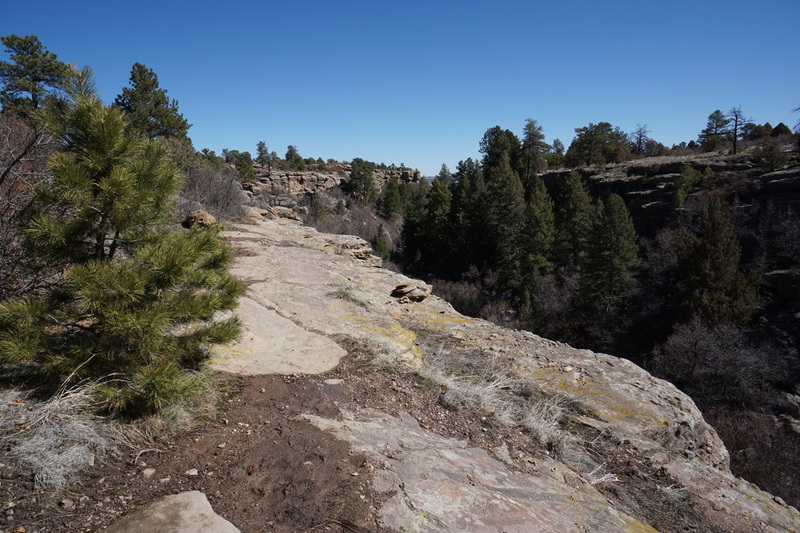 When the trail gains the canyon rim, the views up and down canyon take center stage. Follow the mostly level trail along the rim, through the open space boundary gate until it joins the Gateway Mesa Open Space Trail. [If you want to add 1.8 miles to the hike you can hike the Chuck's Loop trail in the Gateway Mesa Open Space.] This marks the turnaround point for this hike. 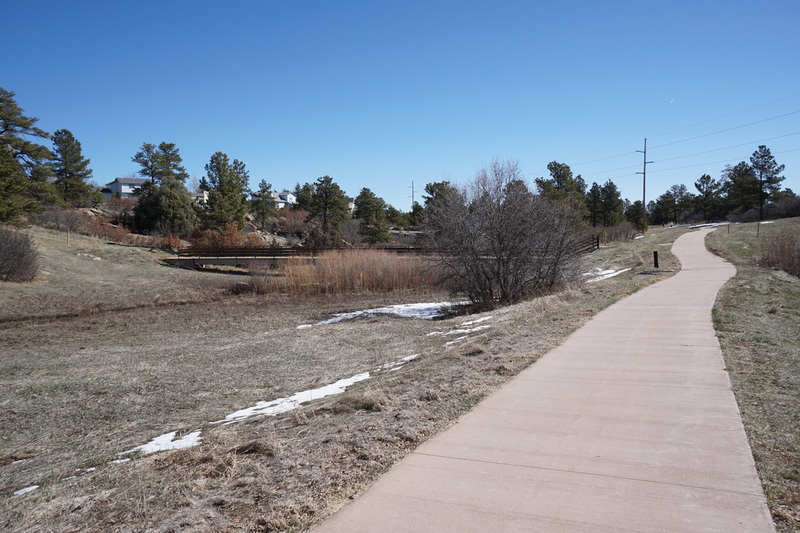 When you return to the paved Mitchell Creek Trail, you have two options. 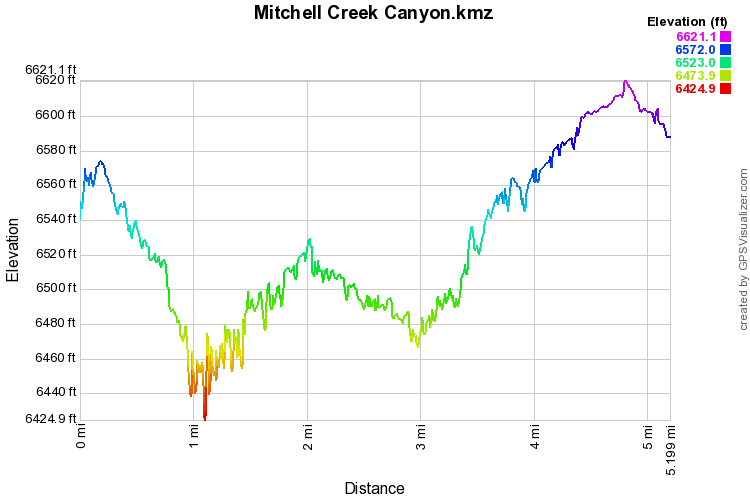 Either return the way you came for a total mileage of about 3.6 miles, or turn left and walk the remainder of the Mitchell Creek Trail for a total of 5.2 miles. 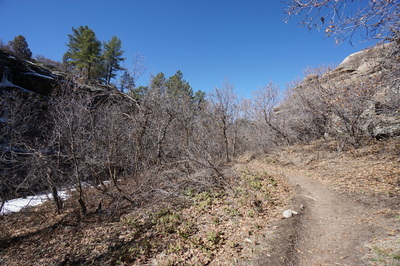 That being said, the most scenic segment of the Mitchell Creek Trail is the part between Founders Park and the Mitchell Creek Canyon Trailhead. 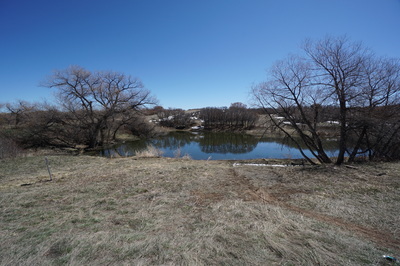 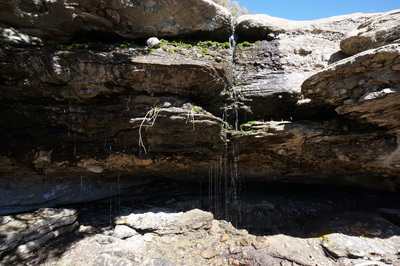 If you continue the entire Mitchel Creek Trail, then you follow the canyon walls for a time, walk past a nice little pond until you reach Mikelson Blvd. 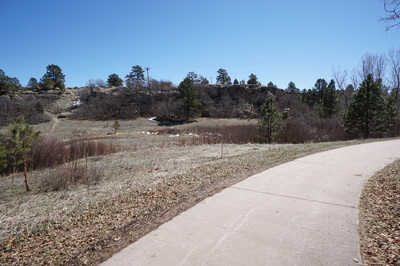 When you cross Mikelson Blvd you enter Mitchell Gulch Park and follow the trail to the south point of the park. Turn a sharp right and follow the high tension wires back to the north to return to Founders Park.